For other uses, see New Brunswick (disambiguation). The Confederation Bridge connects New Brunswick and Prince Edward Island. New Brunswick (postal abbreviation NB) is a province in the eastern part of Canada. The capital city of New Brunswick is Fredericton. Other large cities are Saint John and Moncton. More than 750,000 people live in New Brunswick. 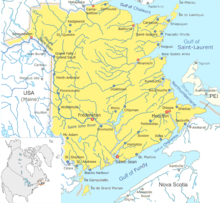 The province is bordered by Quebec in the west, Nova Scotia in the east and the American state of Maine in the south. There is a link to Prince Edward Island also. The English and French languages are both spoken in New Brunswick, and it is the only province in Canada where both languages are official. This is because about 33% of the people living in New Brunswick speak French. Some industries including forestry, mining, and farming are important to the province, and especially fishing since it is near the Atlantic Ocean. This page was last changed on 9 November 2018, at 11:24.